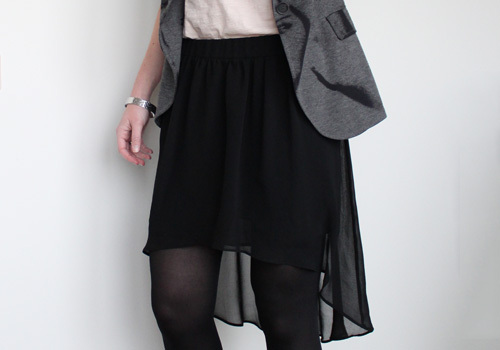 This is the skirt i bought in Berlin (also seen here). Buying it was a good choice i think; there is nothing similar in my closet so i like the different look it creates. And it proves to be a pretty practical skirt too, for i still was able to cycle decently ;). Because of the transparent layers, it needs some sturdy shoes like platform heels or biker boots. The heels i'm wearing here are a great find, though it takes ages to get them on with all these straps, once they're on, they're so comfy! As you might have noticed, i've updated the look of the blog. I am curious for your thoughts, what do you think of the improvements? I haven't seen your blog before the update but I really like the clean design you have now. Also really like those shoes!